In St. Louis, there is a group making sure that the involvement of women in the local and national craft beer movements continues to grow and prosper. They’re called OG Women’s Craft Beer Collective. They accomplish their mission by providing craft beer and home-brew education, showing support for women in the craft beer industry and general involvement in St. Louis to better our community. 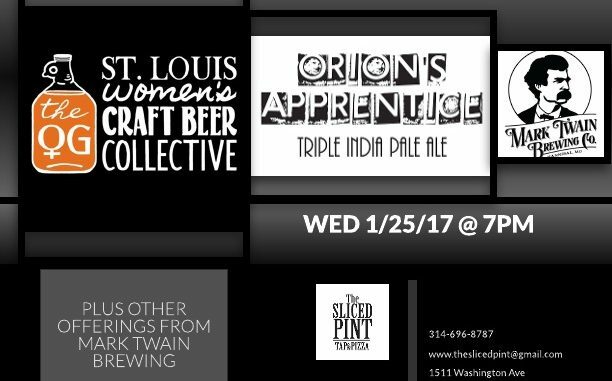 This week is your chance to meet the ladies of OG, as they release a new collaboration beer with Mark Twain Brewery from Hannibal, Missouri. They will also be tapping up some of your favorites from Mark Twain! The release will be held Wednesday, January 25th from 7 p.m. to 11 p.m. at The Sliced Pint located at 1511 Washington Ave, St. Louis 63103.